Videogame war is fun. Real war is hell. It's a distinction that Arma 3 studio Bohemia Interactive seems anxious to make with the addition of a new and unique prize to its "Make Arma, Not War" content creation contest: the company will send a lucky winner to a conflict zone on a humanitarian mission providing aid to people displaced or harmed by the ravages of war. "As part of their collaboration with the International Committee of the Red Cross (ICRC), Bohemia Interactive will also be handing out the Health Care in Danger Special Award," the contest website states. "Given to the entry which covers the topic of 'health care in danger' the best, the winner(s) will go on a one-week trip to an ICRC mission in a foreign country, organized by the ICRC." At first glance, ensuring videogame characters receive proper care and treatment as prescribed by international law may not sound like as much fun as filling them full of lead, but that's why the prize has been added. 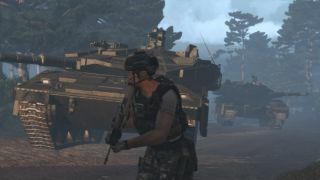 Christian Rouffaer, head of the ICRC's international humanitarian law and videogames project, suggests in the video above one possibility that would see enemy soldiers taken prisoner prevented from respawning, giving a tactical advantage to the team providing the care. Rouffaer said he couldn't reveal where the winner will go, no doubt in part because it's impossible to say where the Red Cross might be operating when the prizes are announced. Not all such zones are suitable, he explained, and the idea isn't to inflict the horrors of war but to educate and inform, and demonstrate the value of what the Red Cross does. The winner might spend the week with a surgical team operating in a stricken area or visiting refugee camps to experience "live interactions with people for who the war is a reality," Rouffaer said. "What we offer you now is a little window, to see the reality by yourself." Submissions to the Make Arma, Not War contest will be accepted until October 28. Winners will be announced on January 15, 2015.